Winter is fast approaching, it is predicted to be as bad as last years big freeze and just to top it off, energy bills are still increasing. Your summer investment in a conservatory has served you well, giving you a beautiful area to enjoy the warm evenings, but how are you going to keep it warm during the winter? Well, the obvious way it will stay warm is on them clear sunny days, where although it is chilly outside, your conservatory is harnessing the suns rays and retaining the heat. To keep this heat in during the winter a set of curtains or blinds can help retain it further into the evening when the sun goes down. When you wake up in the morning make sure you open the curtains or blinds up for the day, the suns heat will bath the conservatory during the light hours, then as the sun starts to go down close your curtains. This will help retain the warmth gained during the day. 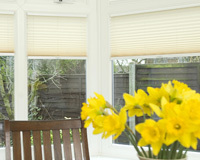 Thomas Sanderson offer some top of the range Solartex blinds that help control the temperature of your conservatory. In the summer it reflects the powerful rays of the sun, but during the winter it insulates the conservatory to retain the heat. Not only that, but their advanced technology means they don’t use aluminium coating or film, which is prone to oxidisation leading to reduced performance and horrible marks that appear. And just to make life that little bit easier – they are easy to clean! There is the obvious method of not opening your doors or windows for a more than a couple of minutes. Heat will escape quickly leaving you in a freezing cold room! The type of glass in the windows and on the roof in your conservatory can also assist during the cold months. If you have an Anglian Home Improvements solaroof you will benefit all year round! Like the Thomas Sanderson blinds it will reflect harmful UV rays (that also fade your furniture) and reduce glare, therefore assisting you control the temperature. However, during the winter it will also help keep the heat in, not letting it get too cool. Anglian Home Improvements use Ultra 2 glass, which has low emissivity glass. Combine this with Anglian’s Ultra gas filled sealed units and you enhance the efficiency of your conservatory by up to 50%, when compared against standard air filled sealed units. To help maintain the temperature of not just your conservatory, but also the room it is attached to, creating a barrier between the two will mean there is less area to be heated. So if you have a door, bi-fold doors or even just curtains separating the two, each room will be warmer as the air does not have as much room to travel around, thus making it easier to heat each room. All of these methods will help retain the temperature of the room, but may not necessarily heat the room. So, here are two ways to heat your conservatory. 1 – Fit a radiator (obviously). If your conservatory has a dwarf wall or an area that a radiator can be fitted, this may be beneficial during the big freeze. 2 – Underfloor heating. 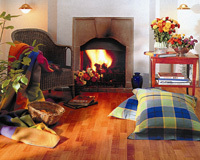 Timberland flooring do a great range of real wood flooring with the extra offer of underfloor heating. The heating system is installed out of sight, warming the floor in a different way to the conventional systems. It heats the floor in the form of waves, known as radiant heat. This heats the surfaces of objects and people in the room, which then heats the surrounding air. The air is heated after the objects which means that air temperatures can be lowered in the room leading to a reduction in your heating bills. It also means you have toasty feet when you walk on it, which I assure you is lovely on an icy cold morning! Failing all of this get out a blanket and wrap up warm this winter, sit in your conservatory and watch the snow fall and listen to the robins sing.